For Magic Mondays this week we show you an array to calm your mind and soul. This week we show you the Eightfold Path array. Notation: Transmute Air into Fire that excludes Heat if a Human are not present and Contain, Sustain, Rotate and Slow the Fire. Description: The array’s true name is not actually the Eightfold Path, but the Alfresians could not easily pronounce the Uttosian name for it and so simply called it for the Uttosian spiritual philosophy in which it is used. In one of the many Uttosian faiths, the Eightfold Path is the way of reaching spiritual and mental enlightenment. The last of the eight paths to enlightenment is to master the art of meditation, and for this the Uttosian monks use this array. For all practical uses and purposes, this array has none. While it falls under the “Utility” heading, it is more of an ornamental array. The fire it creates is as cold as ice and thus no good to anyone, the array requires far more energy than it rightly should by having to spend it on slowing, rotating and sustaining the fire. It may look pretty, but that’s about it. 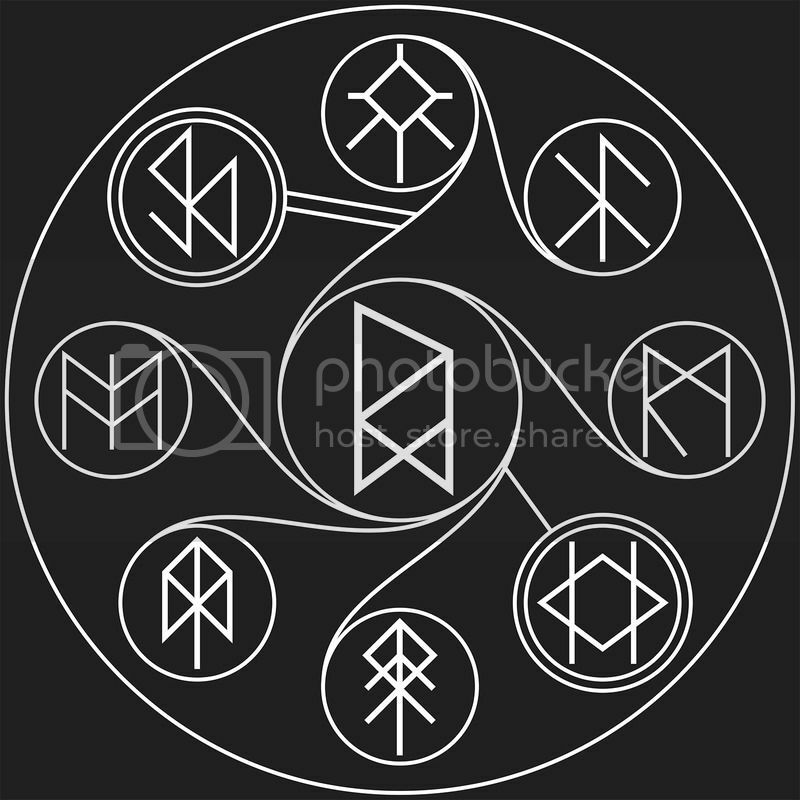 To any practical minded and serious runic scribe, this array would frustrate him to no end… which is precisely it’s point. The Uttosian monks inscribe this array onto small wooden disks that can fit in the palm of your hand. Wood, of course, is an insulator and not a conductor and that’s why you find a footman’s arrays inscribed onto copper or silver. There is a reason for this, however, and that is because this array uses body heat as it’s main source of energy and using copper and silver would allow it to gain too much energy too quickly. To master the art of meditation, a monk simply places the wooden disk inscribed with the Eightfold Path onto one palm and then closes his other hand over it. And so he sits, hands clasped together until his body heat has leached enough energy into the disk to sustain a fire. If he doesn’t meditate long enough, the fire he creates will last only a few seconds and the Eightfold Path requires eight hours of a dancing, ice cold flame. So the monk sits, hour after hour, day after day, week after week, until he is confident there is enough energy in the array. If he is wrong, if he hasn’t waited long enough, the flame will not burn for eight hours and the monk will have to start all over again. In Middelburg, there are precious few Uttosian monks, but the Runist monks of the Monastery in Runedal have taken a liking to this array and have started using it as a test of patience and fortitude, often assigning ill tempered apprentices to produce an eight hour flame if and when they become too insubordinate. Want to put your arrays to good use? Use them in The Ruined People, the new campaign book released last month. Click the image above and see what the arrays can do in the grand city of Middelburg.